Note: This article is a summary of the concepts and exercises presented in the S.A.N.E. Solutions for Challenging Dog Behavior® Seminar by Kathy Cascade. Dealing with fearful, reactive, or aggressive dog behavior is certainly challenging and often a topic of heated debate. A snarling, lunging dog at the end of a leash can be intimidating and downright dangerous. Unfortunately, human reactions often worsen the problem, as do training and handling techniques that only serve to intensify the dog's fear and anxiety. With the increase in "dangerous dog laws" and the number of dogs labeled as "aggressive" surrendered to shelters, effective and respectful solutions to this problem are essential. For the most part, I believe these reactive behaviors are based in fear and develop as a coping mechanism to stressful environmental triggers. (I prefer to use the term "reactivity" as it is actually more descriptive of a specific reaction, i.e. barking or growling that occurs in a specific environmental context. Labeling a dog "aggressive" is often loaded with judgment and may not be an accurate description of the dog's behavior the majority of time). The first priority of any animal (or person for that matter) is to feel safe. We are all aware of the instinctual "fight or flight" response to feeling threatened, but what happens when we take away the option to escape from the scary thing? Everything changes when a dog is held on a tight leash or cornered in a small, contained space. Nothing increases anxiety more than being "trapped" when feeling nervous or scared. Imagine how you would feel at your next dentist or doctor appointment if the technician strapped you to the chair for your procedure! Dogs use a different language to tell us when they are feeling worried or nervous, so we must learn to observe their specific body language and more subtle communication signals. Turid Rugass has eloquently described what she refers to as "calming signals" that dogs use to communicate non-threatening intent to one another and to humans. In her latest book, "For the Love of a Dog, Understanding Emotion in You and Your Best Friend", Patricia McConnell shares several great photographs of canine facial expressions and body language. From a TTouch perspective, we also know that posture and balance reflect emotional states. Recognizing these visual cues and responding to the dog's need to feel safe is the first step in a process I call "building trust one experience at a time." Working with reactivity requires an integrated approach designed to help dogs (and people) reduce stress, build confidence, and become more adaptable. The goal is to give the dog a new experience of feeling safe, relaxed, and in control while in a challenging environment or in the presence of other dogs or people, which previously would have elicited a fearful response. The S.A.N.E. Solutions for Challenging Dog Behavior® Seminar is a collection of concepts, tools, and exercises designed to accomplish the goals stated above. Tellington TTouch is one of the key components of this approach. We know that states of fear, anxiety, and arousal are associated with dramatic physiological changes in the body through the release of powerful hormones and neurochemicals. One of the most basic reactions is an increase in muscle tension throughout the body, which affects posture and movement. We can use TTouch bodywork to help reduce this physiological arousal and muscle tension, which underlies much reactive behavior. Communicating in a non-threatening and effective manner is also critical to reducing dog reactivity and we need effective tools to help the dog learn new responses. The use of a head halter and/or harness with two points of contact allows us to remove pressure from the dog's neck (discussed below), and give more meaningful and subtle leash signals. In order to give the dog an opportunity to feel safe while learning more appropriate responses to other dogs (or people), we need to engage the dog in a purposeful movement activity. Movement removes the feeling of being trapped, and with frequent pauses to experience a state of physical balance, we also influence emotional and mental balance. We can accomplish this using the TTouch Confidence Course®. Remove pressure from the neck. One of the first and most important things we can easily do to help a dog feel more secure is to remove pressure from the dog's neck. Even the slightest pressure on the neck restricts the breath. In the moment of a fearful or anxious encounter (and this can include just looking at another dog or person), a sensation of choking or not being able to breathe only heightens the concern. In addition, one leash contact to a collar on the neck is not the most effective way to rebalance a dog that is pulling, straining, or leaning forward. The use of a head collar with a second point of contact on a harness or flat collar removes the possibility of constant tension on the neck and helps us to bring the dog back into a position of balance on all four feet. The head collar also allows us to encourage the dog to avert his eyes or slightly turn his head away from another dog (which is a calming signal to the other dog) with a very small signal. Allow the dog to have enough space. Space is the single most important factor to averting any reactive behavior and helping a dog feel safe! By paying very close attention to the dog's signals, we can quickly figure out where the spatial zone of comfort is for any particular dog. This allows us to start the process of slowly introducing another dog in the safe, systematic process described below. Often this is easier to accomplish in an outdoor setting, which allows for greater distance between dogs if needed. Start with a neutral dog. A neutral dog is one who is confident, uses appropriate calming signals, and most importantly, will not react to another dog "yelling" at him! Often a good neutral dog can illicit a calm response from another nervous or fearful dog without the handler having to do anything. Sometimes we even start with a stuffed dog to assess the level of arousal and allow the reactive dog an opportunity to approach. Check your own emotions. It is important that the handler not react to the dog's reactions. This is not always easy if it is your own dog! Maintaining a calm, confident, and neutral emotional state when working with a reactive dog can greatly influence the dog's emotional state. Releasing tension from your body and being aware of your own balance/neutral pelvis position makes you much more effective in the event the dog does react or suddenly pulls you toward the other dog. A word of caution: If you do not feel confident working with dogs that are reactive to other dogs and/or especially to people, then I strongly advise you to get help from an experienced trainer or practitioner. We want to set the dog up to be successful. This means that we will do everything we can to create a situation that allows the dog to feel safe and does not illicit a fearful or aggressive reaction. Remember, adequate spacing will be the crucial factor. 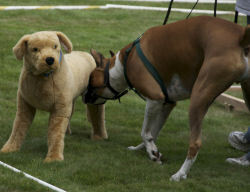 It is important to allow the fearful dog to look at the other dog. We all know that if something is scary, we want to know what it is doing and where it is! Allowing the dog to look for a few seconds can relieve his anxiety, however if the dog continues to stare or get aroused, then simply ask the dog to avert his eyes with a soft signal on the head halter. Moving or changing direction can also engage the dog's attention again. The question often arises about the use of food rewards in working with aggression and reactivity. Other methods use food as a primary distraction to keep a dog from looking at another dog, and avoid any reaction. I certainly endorse the mindful use of food and reward in training, and sometimes it is a very successful tool. However, food can also be over stimulating and our goal is to have the dog remain in a calm, relaxed and balanced physical state. I also believe that food as a distraction does not necessarily teach a dog to feel confident, but simply overrules the reaction for the moment. If the dog does not get over aroused with the food, then certainly it can also be used occasionally during the exercise. Each step of this exercise is slightly more challenging and the decision to go to the next step will depend on the dog's reactions and our close observation of body language. It is also important to keep the sessions relatively short, usually lasting from ten to no more than twenty minutes. Following the neutral dog at a safe distance in a large circular pattern. This can be done on the outer area of the confidence course. The handlers will walk the dogs for a few feet and then come to a momentary stop to allow the dogs to experience standing in nice balance with no tension on the leash. The pauses are short, and then the handlers begin walking again. (In the photo sequence to the right), we are working to reduce the German Sheppard's reactivity). Begin using the TTouch labyrinth. The first time through, the reactive dog enters the labyrinth just as the neutral dog is making the second turn and exiting. The dogs are not actually facing one another at any point. Gradually decrease the distance between the dogs. Another person can strategically step between the dogs at the point in the labyrinth where they face one another. Walking in parallel. Now have both dogs walk over the poles in parallel with adequate distance between them. A third person can also walk between the dogs. Repeat this step a few times, gradually decreasing the distance between the dogs if possible. Allow the dogs to stop every few feet to stand in balance, and watch for calming signals. When the fearful dog exhibits calming signals and looks away from the other dog, I consider the exercise a great success! Walking towards and then past the neutral dog. Again, a third person can assist by walking between the dogs if needed. You can also use cones as a partial barrier. Gradually have the dogs come to a stop facing one another briefly if possible.